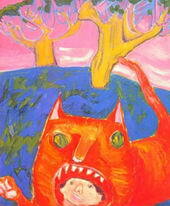 Read about the Museum of Bad Art, "too bad to be ignored". Find out about its location and main displays. Museum of Bad Art (MOBA), in Dedham, Massachusetts, USA, is a private museum dedicated to the tongue-in-cheek display of poorly conceived or executed examples of naïve art in the form of paintings or sculpture. Founded in 1993, in two years the display space moved from a private home to the basement of the Dedham Community Theatre. The permanent collection includes 250 pieces, twenty-five of which are on public display at any one time. "Art too bad to be ignored" is the museum's motto. The paintings and sculptures that were collected are works of exuberant art by people who sometimes don't have a clue what they're doing. The descriptions are attached to various pieces throughout the gallery, which are often parodies of more sober art reviews and that extend the humorous presentation. 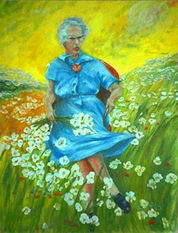 The most famous of MOBA's collection is Lucy in the Field with Flowers. It was found in the trash in Boston by Scott Wilson, who later founded the museum, and is referred to as "MOBA's Mona Lisa". Once the museum even has been the victim of an art theft. MOBA is available to all at the MOBA Permanent Gallery, in the Dedham Community Theater, in Dedham Square, Massachusetts. It is conveniently located just outside the men's room, the gallery is open whenever movies are showing, typically 5 to 11pm on weekdays, noon to 11 on weekends and school holidays. It is supported entirely by voluntary contributions and sales of MOBA gifts.